What Is a Robotic Integrator? What is an Industrial Robot Integrator you ask? A Robotic Integrator offers specialized expertise and experience in installing and maintaining robotic systems. They are responsible in making sure that your end of line equipment is running as expected. Each time you take a manual process and convert it to automation a robotic integrator is needed. Selecting a robotic integrator that fits your needs is important. Choosing an integrator that has years of integration experience and can leverage product knowledge and past project experience. A good integrator will help select the robot and design and provide the end-effect necessary to perform the task. The integrator can provide drawings and time studies often incorporating 3D simulations to demonstrate how the robot will function in the cell. This portion of the process is important as it helps make any adjustments so the proper payload, speed and reached are achieved. This will help save time and money in the long run. Once the robot integrator is acquainted with your business expectations, application specific details must be discussed. This could include anything from 3D CAD drawings, to production goals pre and post automation, as well as cycle time expectations. This information will very depending on the type of operation but are all equally important in the process of integration. Your integrator will offer preventative maintenance programs beyond the installation of the robotic system. Working with the integrator to schedule an annual maintenance will help reduce down time. Keeping up on your maintenance program will help with the longevity of your robot. Most robots should last 15-20 years depending on the environment, application, and maintenance. 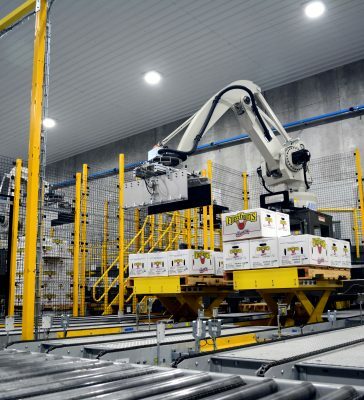 To best achieve your ROI on your robot, make sure you find a robotic integrator that understands your productivity needs during and after the robotic installation.